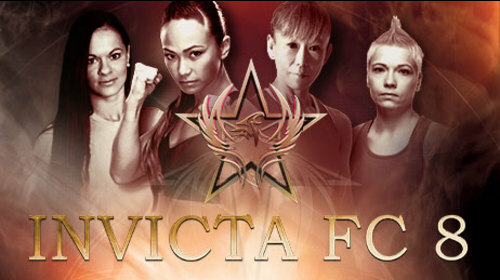 Invicta Fighting Championships is an American professional mixed martial arts organization for female fighters. 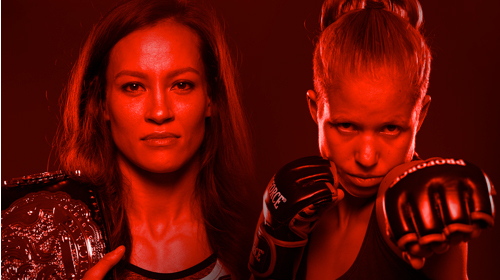 Featured fighters include Cris Cyborg, Paige VanZant, Alexa Grasso, Angela Hill, Tonya Evinger, Carla Esparza, Jessica Penne, Tecia Torres, Tiffany "Timebomb" Van Soest, and more. "Invicta" is Latin for "invincible and incomparable". 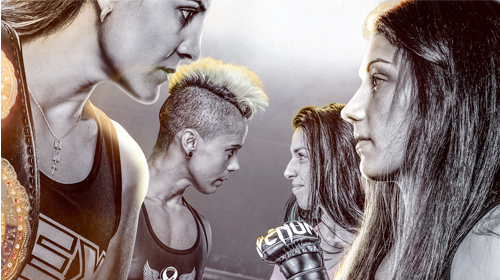 Invicta FC 34 Porto vs Gonzalez Feb 15, 2019 (3:28:50) In the night’s main event, the vacant flyweight title will be on the line between Brazilian veteran Vanessa Porto and surging contender Pearl Gonzalez. 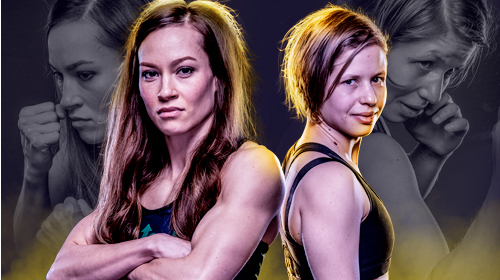 Invicta FC 33 Frey vs Grusander 2 Dec 15, 2018 (2:59:36) Atomweights Jinh Yu Frey and Minna Grusander are going to run it back for the atomweight title at Invicta FC 33. The pair met previously in July, with the Texas fighter Frey edging Finland’s Grusander on the scorecards after five, hard-fought rounds. Invicta FC 32 Spencer vs Sorenson Nov 16, 2018 (4:18:49) The Invicta FC Featherweight Title is up for grabs and Felicia Spencer and Pam Sorenson will battle it out to see who can take it home. Invicta FC 32 will also see the return of the first standout fighter from Invicta FC 1, Kaitlin Young who returns after four years away from the Invicta cage. 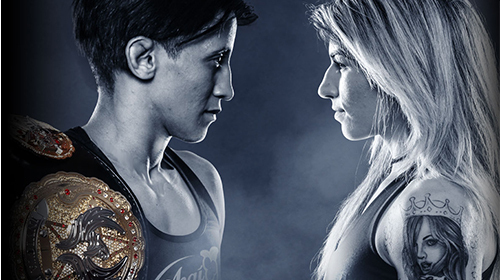 Invicta FC 31 Jandiroba vs Morandin Sep 1, 2018 (3:56:00) The Invicta FC strawweight title will be on the line as Virna Jandiroba looks to defend it for the first time when she faces Janaisa Morandin in the main event of Invicta FC 31. Invicta FC 30 Yu Frey vs Grusander Jul 21, 2018 (3:48:26) The atomweight title will be on the line when Texas product Jinh Yu Frey takes on Finland’s Minna Grusander in the night’s headliner. 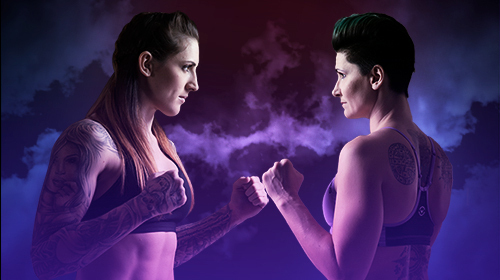 Invicta FC 29 Kaufman vs Lehner May 4, 2018 (3:30:03) The bantamweight title is on the line as veteran Sarah Kaufman meets unbeaten Katharina Lehner. Invicta FC 28 Mizuki vs Jandiroba Mar 24, 2018 (4:38:57) In the night’s main event, Mizuki Inoue and Virna Jandiroba clash for the strawweight title. Also on the card, undefeated strawweight Kali Robbins takes on UFC veteran Pearl Gonzalez. 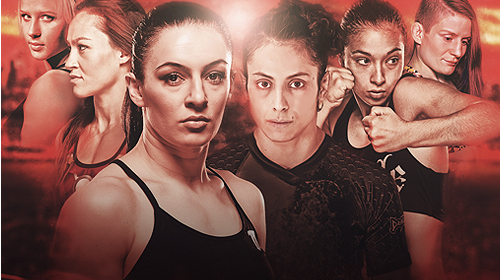 Invicta FC 27 Kianzad vs Kaufman Jan 13, 2018 (4:06:10) Invicta FC returns with their first show of 2018 and all the action is right here on UFC FIGHT PASS. 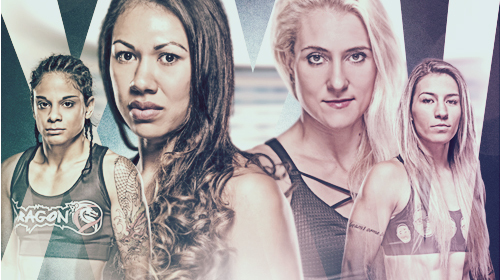 Invicta FC 26 Maia vs Niedzwiedz Dec 8, 2017 (3:36:51) Invicta Fighting Championships will return to action on Friday, Dec. 8, from the historic Scottish Rite Temple in Kansas City. Invicta FC 26 is stacked and features the debut of top prospect Mackenzie Dern. 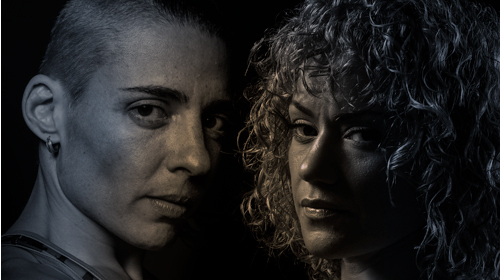 In the night’s main event, flyweight champion Jennifer Maia will defend her 125-pound title against undefeated Polish fighter Agnieszka Niedzwiedz. Invicta FC 25 Pa’aluhi vs Kunitskaya Aug 31, 2017 (4:11:53) In the night’s main event, Hawaiian Raquel Pa’aluhi (6-5) will face off with former title challenger Yana Kunitskaya (9-3, 1 NC) for the vacant bantamweight championship. 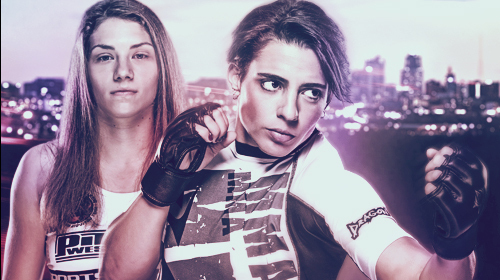 Invicta FC 24 Dudieva vs Borella Jul 15, 2017 (3:05:59) The flyweight bout between UFC veteran Milana Dudieva and Mara Romero Borella is set for the main event of Invicta FC 24. Invicta FC 23 Porto vs Niedźwiedź May 20, 2017 (4:06:52) In the night’s main event, former flyweight title challenger Vanessa Porto meets undefeated Agnieszka Niedźwiedź of Poland. 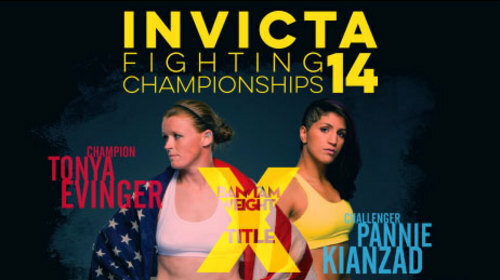 Invicta FC 22 Evinger vs Kunitskaya 2 Mar 25, 2017 (3:16:54) The rematch of 2016’s most controversial title fight is live from Kansas City this Saturday as Invicta bantamweight champion Tonya Evinger and Yana Kunitskaya go to war to settle the score! Invicta FC 21 Anderson vs Tweet Jan 14, 2017 (0:00) Seven great bouts are set including a featherweight matchup between Megan Anderson (7-2) and Charmaine Tweet (9-5) in the main event of Invicta FC 21. 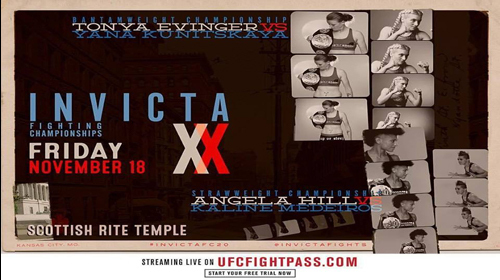 Invicta FC 20 Evinger vs Kunitskaya Nov 19, 2016 (3:47:08) In the night’s headliner, reigning bantamweight champion Tonya Evinger will look to defend her belt against Russian newcomer Yana Kunitskaya. 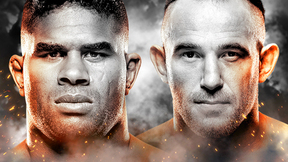 The co-main event will also feature gold on the line as strawweight champion Angela Hill meets surging Brazilian Kaline Medeiros. 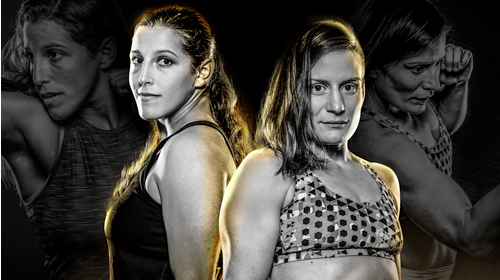 Invicta FC 19 Maia vs Modafferi Sep 23, 2016 (3:30:00) In the night’s main event, interim flyweight champion Jennifer Maia (13-4-1) will put her belt on the line against veteran Roxanne Modafferi (19-12). 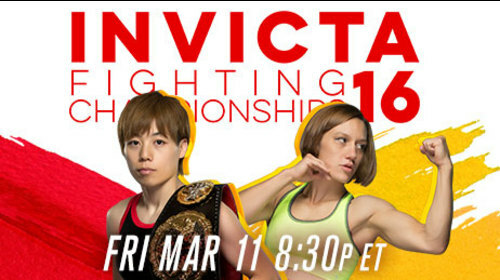 The co-main event will also feature gold on the line as atomweight champion Ayaka Hamasaki (13-1) aims to make her second title defense against Jinh Yu Frey (5-1). 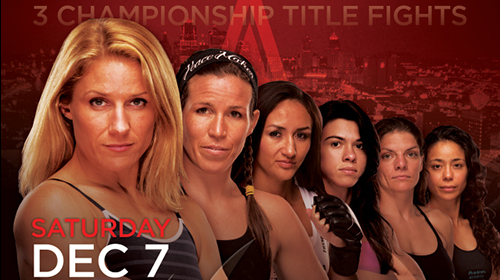 Plus, don't miss the Invicta FC debut of Tiffany "Time Bomb" Van Soest! 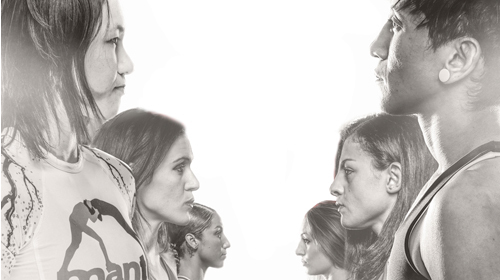 Invicta FC 18 Grasso vs Esquibel Jul 29, 2016 (3:09:14) Nine anticipated bouts are set for Invicta FC 18 including a huge strawweight matchup as Alexa Grasso meets Jodie Esquibel in the main event. 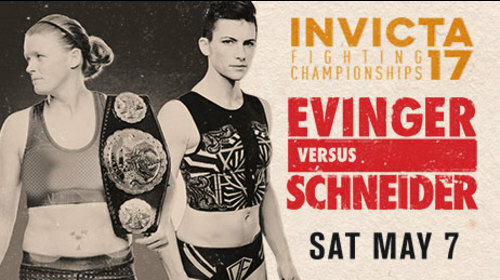 Invicta FC 17 Evinger vs Schneider May 7, 2016 (4:17:24) Headlined by a bantamweight title fight between champion Tonya Evinger (17-5) and California’s own Colleen Schneider (10-6), Invicta FC returns to UFC FIGHT PASS for Invicta FC 17. 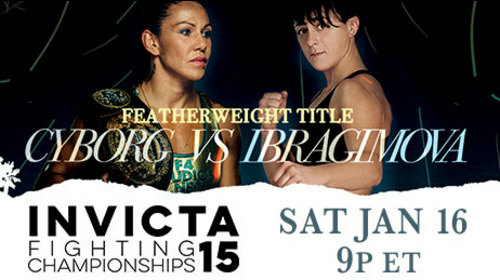 Invicta FC 15 Cyborg vs Ibragimova Jan 16, 2016 (3:06:22) Headlining the event will be Invicta featherweight champion Cristiane "Cyborg" Justino (14-1, 1 NC), who will put her belt on the line against Russian newcomer Daria Ibragimova (9-1). In the co-main event, the strawweight title will be up for grabs between champion Livia Renata Souza (8-0) and fellow unbeaten DeAnna Bennett (8-0). 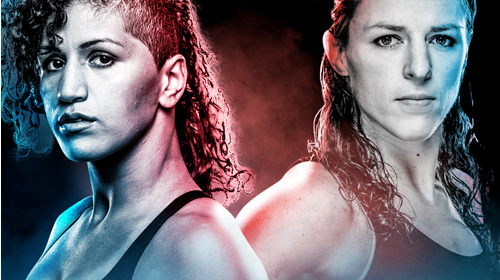 Invicta FC 13 Cyborg vs Van Duin Jul 9, 2015 (3:20:07) Headlining the event will be a featherweight title fight between champion Cristiane “Cyborg” Justino (13-1, 1 NC) and New Zealand’s Faith Van Duin (5-1). In the night’s co-main event, a new bantamweight champion will be crowned as Tonya Evinger (15-5) locks horns with Mexico’s Irene Aldana (5-1). 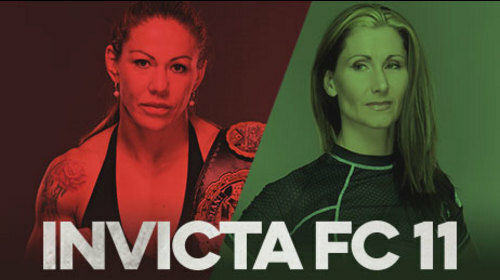 Invicta FC 12 Kankaanpaa vs Souza Apr 24, 2015 (4:00:01) Invicta FC's strawweight title is on the line in the main event as champion Katja "Killer Bunny" Kankaanpaa (10-1-1) of Finland makes her first title defense against undefeated submission specialist Livia Renata "Livinha" Souza (7-0) of Brazil. 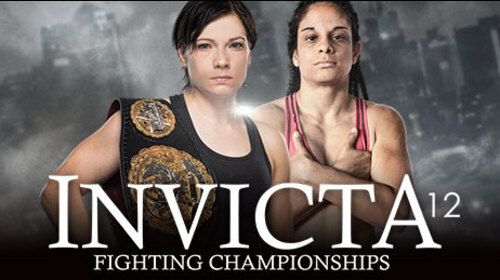 Invicta FC 11 Cyborg vs Tweet Feb 27, 2015 (1:32:51) The world’s leading all-female MMA organization, Invicta FC, returns with their eleventh event on Friday, February 27, with its first event ever from Los Angeles, California. In the headline attraction, world featherweight champion Cris “Cyborg” Justino makes her long awaited return to action to take on the in-form, 6-foot tall Charmaine Tweet. 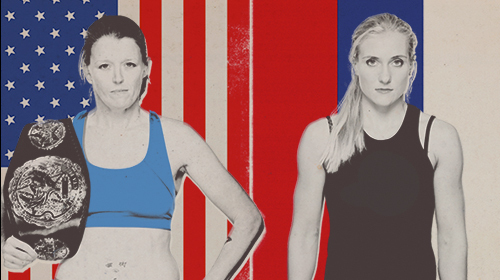 It’s a battle between two of the most physically imposing female fighters in the world at Invicta FC 11. 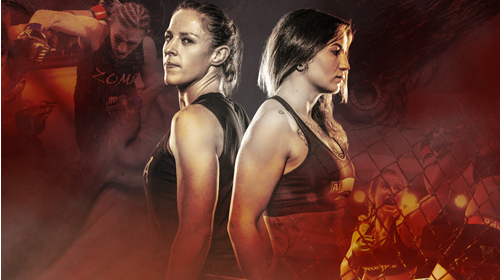 Invicta FC 11 Cyborg vs Tweet Prelims Feb 27, 2015 (1:32:22) Invicta FC 11 Prelims begin at 10p/7p ETPT and include J.J. Aldrich vs. Jamie Moyle, Amy Montenegro vs. Brianna Van Buren, Rachel Cummins vs. Christine Stanley and Aspen Ladd vs. Ana Carolina Vidal. 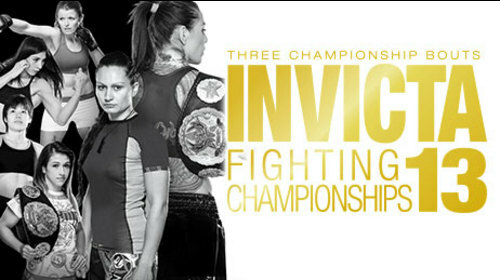 Invicta FC 10 Waterson vs Tiburcio Dec 5, 2014 (3:11:51) The world’s leading all-female MMA organization, Invicta FC, returns with their tenth event on Friday, December 5, with a 10-fight card from the Arena Theatre in Houston, Texas. In the headline attraction, world atomweight champion Michelle “The Karate Hottie” Waterson makes the second defense of her title against the charging Brazilian challenger Hercia Tiburcio. It is striker vs submission specialist in a fight to find the best female 105lbs fighter in the world. 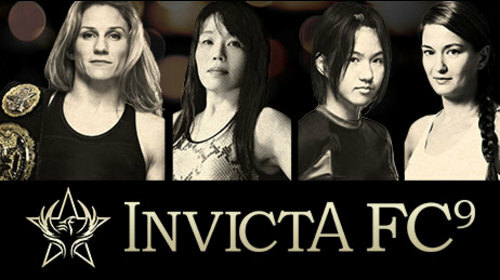 Invicta FC 9 Honchak vs Hashi Nov 1, 2014 (4:29:08) The Invicta FC flyweight championship up for grabs as pound-for-pound women’s talent Barb Honchak puts the gold on the line against the vastly experienced former Strikeforce bantamweight challenger Takayo Hashi. In the co-main event, 20-year-old sensation Mizuki Inoue puts her growing reputation on the line against the undefeated submission specialist Karolina Kowalkiewicz. Plus, seven more fights from the world’s premier all-female organization. 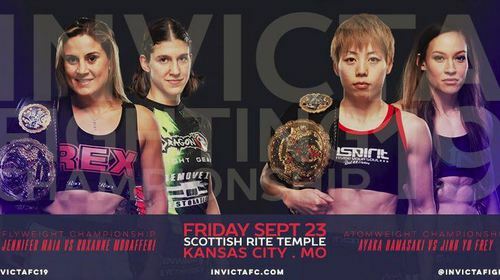 Invicta FC 8 Waterson vs Tamada Sep 6, 2014 (4:23:19) Two Invicta FC titles were up for grabs at Invicta 8, which took place at the Municipal Auditorium in Kansas City, Mo. In the main event of an action packed evening, atomweight champ the “Karate Hottie” Michelle Waterson returned to action to face the teak-tough Japanese challenger Yasuko Tamada while, in the co-main event, Finland’s Katja Kankaanpaa took on Stephanie Eggink for the vacant strawweight belt. Also on the card, the rubber match between Roxanne Modafferi and Tara LaRosa and a historic lightweight grudge match between Charmaine Tweet and Veronica Rothenhausler. Invicta FC 7 Honchak vs Smith Dec 7, 2013 (3:13:41) Two Invicta championships were on the line in the promotion’s seventh event, which was staged at the Ameristar Casino, Kansas City. First, undefeated Lauren Murphy, who only began training to encourage her son to take up sport, took her shot at the vacant bantamweight belt against kickboxing specialist Miriam Nakamoto. Then, flyweight queen Barb Honchak defended her title against the aggressive Leslie Smith. Plus, unbeaten flyweight Tecia Torres took on cult hero Felice Herrig. 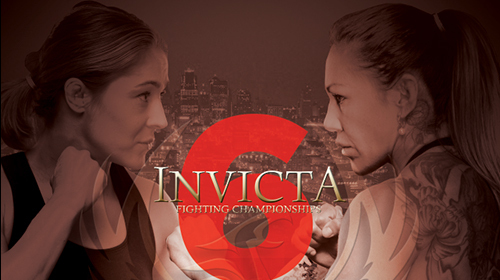 Invicta FC 6 Coenen vs Cyborg Jul 13, 2013 (3:45:38) Two former Strikeforce champions, Marloes Coenen and Cris Cyborg, collide with the inaugural Invicta featherweight title on the line. The pair had met in 2010, with Cyborg’s strength winning the day, but Coenen was determined to avenge that defeat at the Ameristar Casino, Kansas City. Invicta 6 also featured a stacked undercard including the US debut of Nova União sensation Cláudia Gadelha.